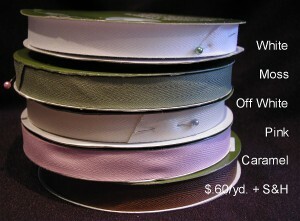 I LOVE the colors of this twill tape!!! These are the ones I currently have in stock - if you would like to order some please just send me an e-mail by clicking on the link to the left. Please include your name and address so that I can send you an accurate estimate as to the shipping and handling charges (handling charges include the price of the box/envelope and packing materials needed to insure that your product will arrive looking good Ü). I hope that you find this helpful (and that I don't run out of twill before the day ends - LOL). You guys are the bestest!!! Have fun playing with this technique! AND for those who are wondering about my printer here is how mine works. I print the words on my paper and then I lay the paper back face down in the paper tray (each printer varies so you need to figure out how yours works first). My printer brings it up and around the cartridge - so it does NOT go straight through. This is why I believe it is important to have the adhesive right on the leading edge so that the twill is affixed solidly to your paper. I am using my ATG adhesive which REALLY holds, the good news is that when the printing process is complete I have been able to immediately pull it off without any problems. HTH's. Below is the card that started the questions regarding printing on twill tape that I shared yesterday to participate in a SCS Challenge. 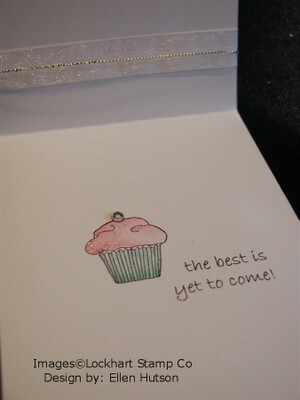 If you haven't done these yet you should - they are so much fun and they really help you "grow" as a stamper! The first was using the sketch challenge SC82. 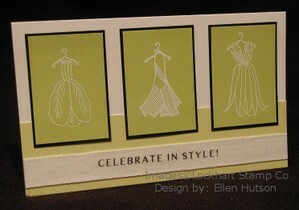 I LOVE elegant and so in my quest to use the layout inspired in this weeks challenge along with the Lockhart Stamp vegetable couture dresses I decided to keep it simple and only use white. I do believe it turned out rather striking and thought the color combo was a definite eye-popper. I was trying to come up with something witty to say but after a long day at the race track and the clock having struck midnight at least a half hour earlier - it just wasn't coming to me. The thought behind this creation is that the recipient does not yet know the gender of the baby and therefore the use of the three colors from this weeks color challenge - pink, green and blue. Then I tried to come up with a humorous quote regarding triplets - nada!!! I guess that just means it is time to call it quits for the night and cop out with the typical verses that are always there and ready Ü So for all those out in cyberville if you can help me come up with a caption for this card that would be humorous or suitable I'd be tickled!!! Have a great day and I hope to get a few more things posted throughout the week. #20 - Sunny (tasly)!!! My 6-yr old DD asked me - "Did I pick a good number mommy?" Oh what a sweet little face she has! So Sunny please tell me which one of the images from the Lockhart line you would like to have! There will also be other goodies in the package and I will post a picture here before it gets sent off. I'm certain I'll be doing this again because I love the excitement of my girls when they get to help me put together a package of goodies for "someone special". For now I'm off to the races!!! LITERALLY - it is my MIL's 80th birthday today and she selected going to the horse races as to how she would like to celebrate her big day. She is one amazingly, wonderful woman - I love her dearly!!! So wish us luck - maybe we'll walk away from the tracks big winners - LOL!!! 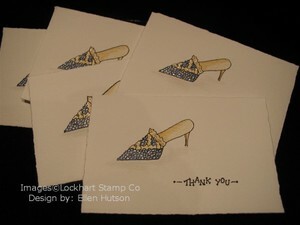 Thank “shoe” to all who have purchased stamps from me over the last couple of weeks! I am REALLY trying to get it together to let each and every one of you know that I appreciate your support more than you could ever imagine – so I am trying to include a special little note card or “something” special with each order that goes out. Last night I was up until 1:30, but I was having so much fun making stacks of these!!! · Jimmy “Chews” (if you don’t know of Jimmy Choos shoes you must google them – they are VERY expensive). · Have a “cherry” day! Lisa you are brilliant!!!! I love ya girl! Don't forget to comment in the CHA thread to enter your name into my "celebration" drawing - Friday is the last day to enter and I'll be having my daughter's pick that number on Saturday! Have a "berry" nice day everyone!!! ETA: Trying to keep this at the top - so the date will keep changing on this entry until Friday. Thanks for sharing in the excitement of new "stuff" with me!!! So instead I have been cruising the internet looking for delicious details! Being that this world is all so new to me and with starting my new endeavour I thought we could have our own little celebration. If you are like me and are just salivating whilst waiting for these new products to actually hit the stores keep reading. Lifetime Moments has done an amazing job sharing the juicy details with us out here in the "real" world. Don't blame me if you get sucked in!!! Consider yourself warned - "The above link may be dangerous on your pocket book and your free time (don't tell me if you are actually looking at these links when you are supposed to be working - because then you might really be in trouble - LOL). Have fun and I'll be back to share some of my favorites with you after I've had plenty of time to digest them all. I CAN already tell you that the Crate Paper and Fontwerks products have me asking for emergency aid. One of my very funny friends has this wonderful way of making me laugh so hard! When she sees something that she finds really beautiful she shouts - "quick, get the paddles"!!! LZ where are you when I need ya girlfriend because I do believe that we all might be needing those paddles after viewing all this gorgeous new stuff (or at the very least a financial advisor Ü). Please share what you find to be a must-have in the comments section below and I will reward one of you lucky people with a very special package. I will have my DD's pick a number come Friday and the lucky winner will receive a special little goodie package from me. I just HAVE to know what everyone has on their wish lists! Thanks girls and I look forward to hearing from you!!! I have to share the beautiful creations my friend Asela has made with you. When she ordered a few stamps from me I could hardly wait to see what she would do with them - fully knowing that whatever she touched would be beautiful! I was soooo tickled when I opened her blog to see these gorgeous creatures on display. To turn the angel into a "get well" fairy - genius!!! I had thought tooth fairy, but she far surpassed that thought Ü Now she has me thinking - this image could be used for a sympathy card as well. Can you come up with any other ideas for this stunning beauty??? I'd love to hear your thoughts! At LAST I finally have taken a minute to sit down and put one of my experiments together! Oh it does feel so good to complete something for a change. 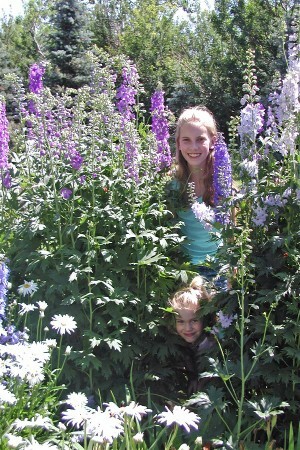 Needless to say it was no easy task - LOL! My table is COVERED I tell ya! and to find a spot to finish the little stamping effects on the background and solid color cardstocks, well... that in itself was the big challenge. 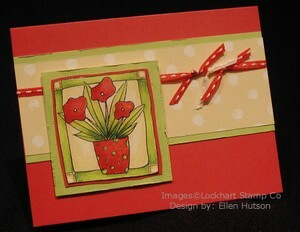 This is a classic layout I just love to do, simple, quick and easy. I love the depth of color in these flowers - this is my dark to light version for anyone wondering. I love music and tonight I spent some time reading up on what you can do with Typepad and I thought - hey wouldn't it be wonderful to allow my guests to listen to their favorite music while visiting my site!!! So I gave it a try and hey - it works!!!! This is exciting - why??? Well it's exciting because I have a REALLY hard time figuring these things out. So with that I sit here happily listening to James Blunt - I LOVE that man's voice - he could sing in another language and I'd still love to listen to him - LOL! So type your favorite artists name into the little green box on the left and a box will pop up - it will say something about needing some file downloaded, but if you just click on OK, it will take you to another screen where you just enter the artist's name again and then you click on the tune you would like to hear. I don't recall downloading anything. So if I am being blonde and getting stuff past my firewall I'm not supposed to someone PLEASE tell me. Another artist I would love to recommend is Keane - another angelic voice IMO. So ENJOY some good music as you delve deep into the depths of my LENGTHY posts - LOL! 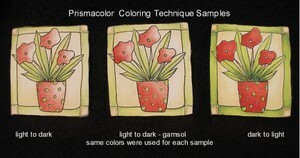 I still have two more galleries I am working on with Lockhart Stamp Company stamps. Unfortunately Typepad has not been cooperating with me Ü. Hopefully I will be able to get the last two galleries of stamps up this morning. Thank you for your patience!!! Where do I begin? I have so much news to share with you!!! Karen Lockhart, owner of Lockhart Stamp Company stamps ... she is a wonderful, incredibly artistic, fun and exciting woman and to be her business associate is my incredible fortune!!! When we get together the room begins to buzz - literally - LOL! The ideas we generate together knock my socks off Ü So what is it that I do when she is the genius behind each and every one of the images in her line??? Her coloring technique is pure magic - so what do I add??? First I would like to let you know that my business is totally independent of Karen's, BUT we are working together to support each other in our life endeavors. Karen is behind me 100% and I am here to help her succeed in every way I know how. I have to wonder if she tires of the calls and e-mails with my latest brain-child of an image she needs to add to her collection or a project I have in the works that I hope will WOW the masses. My first role is one that I absolutely love! I have been creating fun, funky, elegant - you name it - little pieces of art for upcoming publications. We hope that you will be WOW'ed by them when they come out in many of the major stamping and paper crafting publications in the near future. It is so incredibly difficult to sit on these and not share them the instant I create them, but... hopefully it will be worth the wait. I have had so much fun with this aspect of my role. Role #2 - teaching paper crafting classes! I LOVE this aspect of my role as well. My interior design and education training are coming in handy Ü I love to experiment with different products, mediums and techniques, using rubber stamps to create cards, mini-scrapbooks, home decor and art pieces. As a concept artist and paper crafts instructor it is so very gratifying to be able to use my imagination – teaching, sharing creativity and inspiring that vision within others is a privilege. The pleasure of being a part of the “light bulb moment”, the moment when someone’s eyes light up because they have created something for the first time in their life or have created something that brings them joy, is truly rewarding. This brings me to role #3. 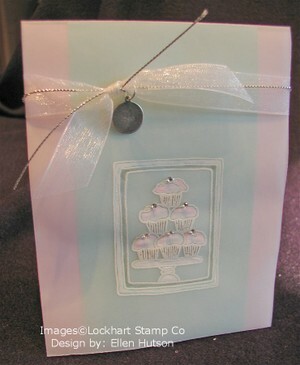 I will be bringing the Lockhart Stamp Company products to the world via the internet!!! The growing pains of getting this off the ground in a manner that I see fitting is what has lead me to my little "band-aid for now". To bring this to you in the fashion that I have conceived is EXTREMELY time consuming and thus I am now offering you this service via my blog until this dream comes true. To purchase your Lockhart Stamp Company images on-line all you need to do is send me an e-mail listing the images you would like to purchase. I will then send you a Paypal invoice and you will be able to use your credit card or bank account to pay for the product and shipping. All orders received by Friday will be shipped out on Monday of the following week. Please e-mail me with any questions you might have because I'm just guessing that you might have questions. My goal is to provide you with superior service, products and examples of how to use that product! Being that I live only 20 minutes from Karen you can be assured that you will get the latest product in the timeliest fashion. I in no way want to compete with your local stamp stores - my role is to service you with that instant ability to order what you need without leaving your home. I take this responsibility seriously and look forward to helping you in this role. I thank you now for your support and enthusiasm and hope to be able to assist you in many ways in the future! People are remarkable, places are extraordinary – this business allows me the privilege of going places I might not otherwise go and meeting people I might not otherwise meet - all this and I can still be here at home for my daughters and husband. I am blessed!!!! Well I'm trying to get on top of everything - LOL! OK - so it's not working, but I have added some fun images to the Lockhart Album and I have a special surprise coming up - hopefully later today Ü It is one I have been working on and it is taking MUCH longer than I had hoped, so I'm putting a bandaid on it and giving it a whirl. 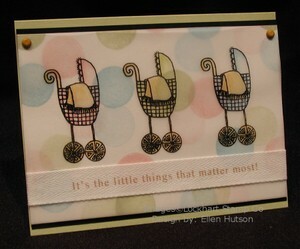 Piris shared her version of the following card this month in the DD gallery - it is AWESOME!!! So if you haven't subscribed yet you must - this month's gallery is sizzlin'!!! So join now and feast your eyes! This is the card I made for my niece's wedding - she is such a fun and funky girl and so I thought it would be the perfect choice for someone so in love. Their wedding cake was actually stacked donuts - oh what fun!!! The sentiment is one I came up with - it is intended to mean that in the years ahead their love will grow and there will be wonderful things to come. even when we would rather it not be!!! Where to begin??? I have been noticeably absent I guess you might say. We headed out for work/vacation on Thursday, June 29th. Being that I needed to be in Spokane to teach classes starting at 2:30 we got an early start. Oh the horror when our Honda Odyssey started lurching after returning to the freeway after a pit-stop! After a quick call to the Spokane Honda dealership we were none to happy to learn that more likely than not our transmission was gone. Egads - what to do??? Jeannie from Stamp Jeannie was so kind to drive the hour to pick me up and get me back to her store to teach both classes. What an awesome group of women!!! Their patience waiting for me to arrive and enthusiasm was much appreciated - I had so much fun sharing coloring and fun new stamping techniques with these wonderful ladies. In the meantime a flat-bed tow truck delivered our hurting vehicle to the dealership. FIngers and toes were crossed that they could get it fixed the next day, but no such luck. After learning that it would go no where before the following Tuesday we jumped in a rental vehicle to head to Calgary for my nieces wedding. I guess I'm not a real truck girl - the only vehicle that they could find that we could drive to Alberta in was a Silverado. I just have to snicker now visualizing us unpacking EVERYTHING from the van and loading it into the back of this pick-up truck and pulling the cover over the big heap of "stuff". I think they wondered if we were making a major move with all the "stuff" we had - LOL. It was a trip filled with many highs and lows to say the least. The wedding was beautiful! We helped make my mom's new condo a little more comfortable with an a/c unit and a new reclining loveseat. We packed up some of the memories from the farm and my dad and said a good-bye of sorts. 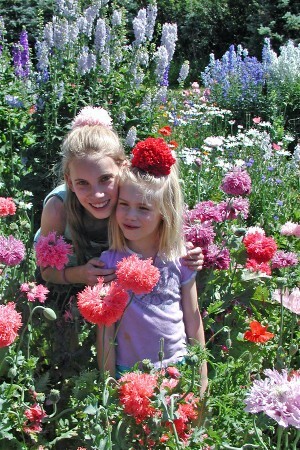 I have to share a couple of pictures of the absolutely amazing flower garden my mom has pampered over the years - it was in all it's glory for us to enjoy - I'm not sure if it's beauty made it harder or easier to say our good-byes. We are now safely back at home with a much improved van Ü I managed to exhaust myself and am fighting bronchitis, but hopefully I will soon have the energy to get this blog in order Ü So if you are still reading this lengthy entry you have more staying power than I would have - LOL. I can hardly wait to delve into my new SU catty, read some of the magazines that arrived on my doorstep whilst I was away and just STAMP!! !